The Supermarine S.5 was a 1920s British single-engined single-seat racing seaplane built by Supermarine. 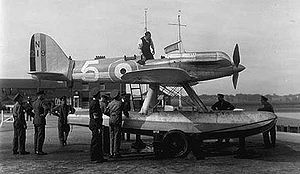 Designed specifically for the Schneider Trophy competition, the S.5 was the progenitor of a line of racing aircraft that ultimately led to the Supermarine Spitfire. The Supermarine S.5 was designed by Reginald Mitchell for the 1927 Schneider Trophy. Following the earlier loss of the S.4 before the 1925 Schneider Trophy event Mitchell designed a new all-metal monoplane racer. Unlike the S.4's all-wood structure, the S.5 featured composite construction with the semi-monocoque fuselage mainly duralumin including the engine cowlings. The S.5 had a low, braced wing with spruce spars and spuce-ply ribs and a plywood skin. The wing surface radiators made up of corrugated copper sheets replaced the Lamblin type radiators of the S.4. Three aircraft were built, one with a direct drive 900 hp (671 kW) Napier Lion VIIA engine, and the other two with a geared 875 hp (652 kW) Napier Lion VIIB engine. The first aircraft flew for the first time on 7 June 1927. The S.5s came 1st and 2nd in the 1927 race held at Venice, the winning aircraft (Serial number N220) was flown by Flight Lieutenant S.N Webster at an average speed of 281.66 mph (453.28 km/h). One S.5, N221 crashed during an attempt on the world air speed record on 12 March 1928, killing the pilot Flight Lieutenant Samuel Kinkead (who had flown the Gloster IV in the 1927 Schneider Trophy Race). Mitchell decided that the Napier engined aircraft had reached its limits of performance due to the powerplant and for the 1929 Schneider Trophy race, redesigned the aircraft with a new Rolls-Royce engine as the Supermarine S.6. Concern over the unreliability of the Gloster VI, led to the High Speed Flight entering one S.5 (N219) along with the two S.6s for the race. The S.5 flown by Flight Lieutenant D'Arcy Creig finished third in 46 min. 15 sec. at a speed of 282.11 mph (454.20 km/h), behind the winning S.6 flown by Flying Officer H.R. Waghorn and a Macchi M.52. Ray Hilborne of Leisure Sports designed a built a full-scale S.5 replica which flew for the first time on 28 August 1975. The replica, powered by a Continental 10-360, used an all-wood construction and incorporated modifications to the wing to lower the stalling speed, water rudders, a slightly wider cockpit and overall weight reduction to an all-up weight of just 1,500 lb, less than 1/2 that of the S.5. In the song "Bill Hosie" by Archie Fisher, the protagonist rebuilds an "S.5 Supermarine" that survived the 1927 Schneider Trophy Race. The aircraft, race and trophy are referred to throughout the song. Hall, John. "Supreme Supermarine." Aeroplane Monthly, Volume 4, No. 11, znovrmbrt 1976. Lumsden, Alec and Terry Heffernan. "Per Mare Probare, Part 15," Aeroplane Monthly, Volume 17, No. 5, May 1989.